While I realize that How To Survive a Robot Uprising is supposed to be a work of comedy I was also expecting some half-serious advice on how to destroy circuits and complex mechanical systems, skills which would be crucial in surviving an actual robot uprising. The author avoids this task and instead just states the obvious for two hundred pages or abuses very tired robot cliches in order to get a cheap laugh (such as the fact that we should avoid robots with glowing red eyes and “zig zag” to avoid being killed by them). This is in contrast to other spoof guides such as the famous Zombie Survival Handbook which actually offer some knowledge on a variety of topics while never taking themselves too seriously. I prefer reading books of this latter quality, wherein I can learn something and score some witty things to banter about. 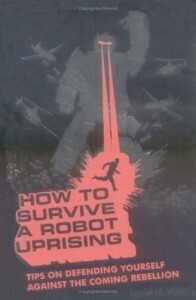 I did not find the humor remotely enjoyable and was aggravated by a complete lack of actual content – from cover to cover How To Survive a Robot Uprising is just a giant waste of time, more useful as a prop than actual reading material.